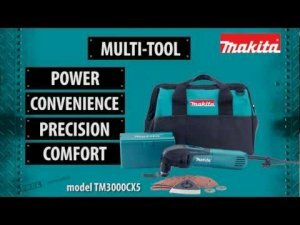 The videos (below) introduce to us the Makita TMC3000CX5 corded oscillation tool and the LXMT025 18-volt cordless oscillation tool. The TMC3000CX5 features a 3.0-amp soft-start motor combined with an electric speed control to maintain power under load and a total oscillation angle (sweep) of 3.2-degrees. This puts the corded Makita on par with newest Bosch in terms of power, but Makita edges out Bosch with a larger oscillating angle. However, it doesn't appear that Makita is offering a tool-less blade change feature like the newest Bosch MX30. Makita does say their oscillating tools will feature a universal blade mount, so this might also align with my December post and mention of the Makita universal blade mount patent. The cordless LXMT025 is very similar to the corded version in terms of features, but unlike the other cordless oscillating tools on the market, it uses an 18-volt battery. This will obviously add a bit more weight to the back end of the tool, but the extended runtime of a larger battery might be worth it. Makita says you get the power of the corded version and up to 15-minutes of total runtime. This is about double the runtime of a 12v Max oscillation tool. An LED task light also appears to be a feature of the LXMT025. According to Burns Tools these models will be available in June. The LXMT025 kit will cost around $330 and the bare tool will cost $130. The corded TMC3000CX5 will cost $170. Remodelers, Carpenters, General Contractors, Plumbers, and Wood Floor Installers, this is the tool every trade can use. Introducing the versatile, new Multi-Tool, from Makita. The TMC3000CX5 delivers power, control, precision, and comfort for a variety of applications. The powerful three-AMP motor with soft-start is engineered for fast cutting, sanding, scraping, and grout removal. The variable speed control dial enables the user to match the speed to the application. And the electronic speed control maintains constant speed under load for smoother operation. For more aggressive cutting and sanding, the Makita Multi-Tool has a 3.2 oscillation angle. For cutting, sanding, scraping, grout removal, and more. Use the tool that will take-on a full range of applications. The Makita Multi-Tool. Cutting, sanding, scraping, and grout-removal -- without the cord. Introducing the versatile new eighteen-volt Lithium-Ion Cordless Multi-Tool. It's available as a kit, or as a bare tool. The LXMT025 delivers power, convenience, precision, and comfort for a variety of applications, in a more compact size. The Makita-built motor delivers six-thousand to twenty-thousand oscillations-per-minute for a full-range of applications. You'll get corded speed and power without the cord, and up to fifteen-minutes of run-time with Makita's eighteen-volt Lithium-Ion battery. And the Makita Multi-Tool accepts most competitive accessories for maximum versatility. With a three-point-two degree oscillation angle, the LXMT025 is engineered for faster cutting. The Makita Multi-Tool has a small-diameter barrel-grip and weighs only four-point-five pounds with an ergonomic rubberized soft-grip. The eighteen-volt Lithium-Ion battery reaches a full-charge in only thirty-minutes for more work and less downtime. 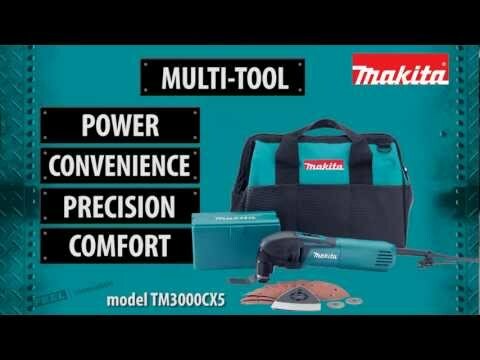 It's part of Makita's growing line-up of cordless tools powered by ONE eighteen-volt Lithium-Ion battery.